Meet Bob. Bob likes upscale watches. Bob looks at an upscale watch retailer’s website, but he doesn’t purchase. Within days of visiting this website, Bob receives a direct mail offer from the retailer. He’s intrigued and thinks, “I like watches! I’m going to open this.” What’s inside is a compelling offer that expires in two weeks. Hmmmm… Bob is considering his watch purchase more. The next day, Bob checks Facebook and sees ads with the same offer for that same watch—again. Interested, Bob clicks the link, goes back to the retailer’s website, and orders his watch! How did the retailer know to send Bob direct mail and digital ads? And why did it work? IWCO Direct has long used the mantra of “reaching the right person, at the right time, with the right message, through the right channel.” Achieving this means you need an intersection of art and science—one that relies heavily on (you guessed it) data. Right Time: Bob received his direct mail piece and digital ads within days of visiting the retailer’s website—striking while the iron is hot—and his interest is piqued. Right Messaging: One key to messaging is addressing and breaking down barriers. What’s keeping Bob from purchasing? The retailer knows prospects question quality, have concerns about price (after all, watches can be expensive), and shipping cost (which customers know because of data/research). They address these by including a testimonial about quality, offering a compelling discount, and including free shipping, alleviating some of the biggest barriers to Bob’s purchase. They then add a sense of urgency by including a two-week deadline so Bob doesn’t let the offer sit in his inbox and gather dust—err… “dust bytes”—only to be forgotten. By applying direct mail best practices and accurately addressing barriers, the retailer has given Bob the push he needs to make the purchase. Right Channel: This is the interesting part that explains why direct mail is so integral to an integrated, multichannel approach. Even though Bob first interacted with the retailer online and ultimately made his purchase online, the combination of touchpoints through multiple channels not only gave validity to the offer, but kept the retailer on Bob’s mind. The channels worked together to keep the retailer’s fancy watches at the top of Bob’s mind without Bob’s Facebook feed showing watch after watch and annoying Bob. Bob visiting the retailer’s website triggered data that sent an offer to the right person, at the right time, with the right message, through the right channels, creating the perfect cadence of data-driven bliss. Now, is this an over-simplification of data-driven marketing? Yes. Is it just one example of how data-driven marketing can work? Absolutely. But it does ultimately explain how we can—and should—use data to drive improved results. When companies employ well thought-out data-driven strategies, their return on marketing investment (ROMI) increases significantly. We’ve done it. We’ve seen it. We do it. It works. Want to reach many, many more Bobs? Then it’s time to develop a new strategy. Get in touch with your IWCO Direct account representative and let us help you master data-driven marketing. Senior Customer Engagement Manager with a BSB in Marketing from the University of Minnesota, Carlson School of Management. Loves everything marketing, especially understanding the ‘why’ behind consumer behavior. 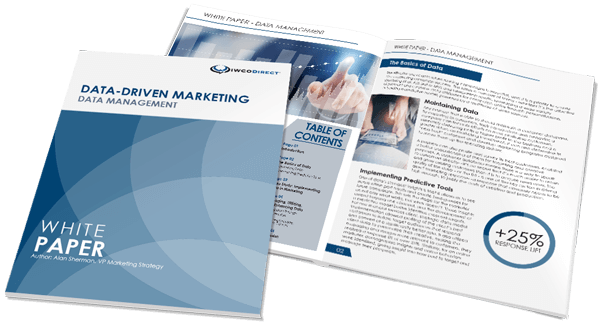 Builds trust, drives communication, and creates open dialogue with clients to produce top-notch deliverables that increase return on marketing investment. Animal lover, avid Vikings fan, mother, wife, and movie lover (especially the ones that just make you laugh).